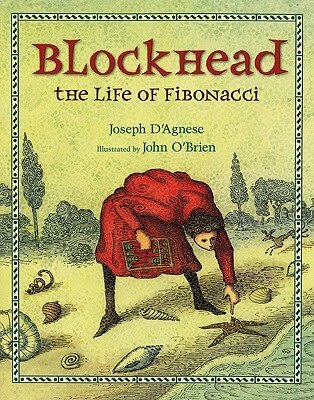 Blockhead: The Life of Fibonacci by Joseph D'Agnese, illustrated by John O'Brien. Ages 7-10. Henry Holt & Company, March 2010. 40 pages. Review copy provided by my local library. "You can call me Blockhead. Everyone else does." So begins this imagined tale of the life of Leonardo Fibonacci (a.k.a. Leonardo of Pisa), medieval mathematician. Fibonacci. He spread the use of Hindu/Arabic numerals in Europe (to replace the more cumbersome Roman numeral system) and he observed and wrote* about the numbers that make up a spiral pattern seen in nature. The pattern was named after him, though it had been written about before by Indian mathematicians. Very little is known about Fibonacci, who lived circa 1170-1240, so Mr. D'Agnese fills in the gaps to bring the tale to life. The story is written in the first person as if Leonardo is telling us about his life. It's a very effective way to make the story accessible and interesting. My favorite thing about this book is the fabulous pairing of text and illustrations. I have to admit that I am not generally a fan of John O'Brien's work (I find the beady eyes to be creepy), but from the first spread, I knew I was in for a treat with this book. In the spread, Leonardo sits alone on a bluff overlooking a farm, sketching a spiral that's laid out before him in the pattern of the fields. Throughout the book, we see spirals everywhere - in people's curls and clothing, the objects that surround Leonardo on the pages (flowers, shells, etc.). A bit of additional biographical information is included at the end of the book and kids are encouraged to look through the pages and spot particular objects that sport a Fibonacci sequence. Read the story of the book's journey to print. Check out interviews with Joseph D'Agnese at GottaBook (don't miss Greg's Fibonacci poems) and Sarah Campbell's Blog. Check out an interview with illustrator John O'Brien at My Cat Eats Bananas and Flies and the Saturday Sketch interview at the MacKids Blog. Read more reviews at Greg LS's Blog and NC Teacher Stuff. Blockhead: The Life of Fibonacci is on shelves now! Today's Nonfiction Monday! Head on over to Shelf-Employed for this week's roundup! *According to Wikipedia, Indian mathematicians had already described the pattern, but Fibonacci introduced it to Western Europe.